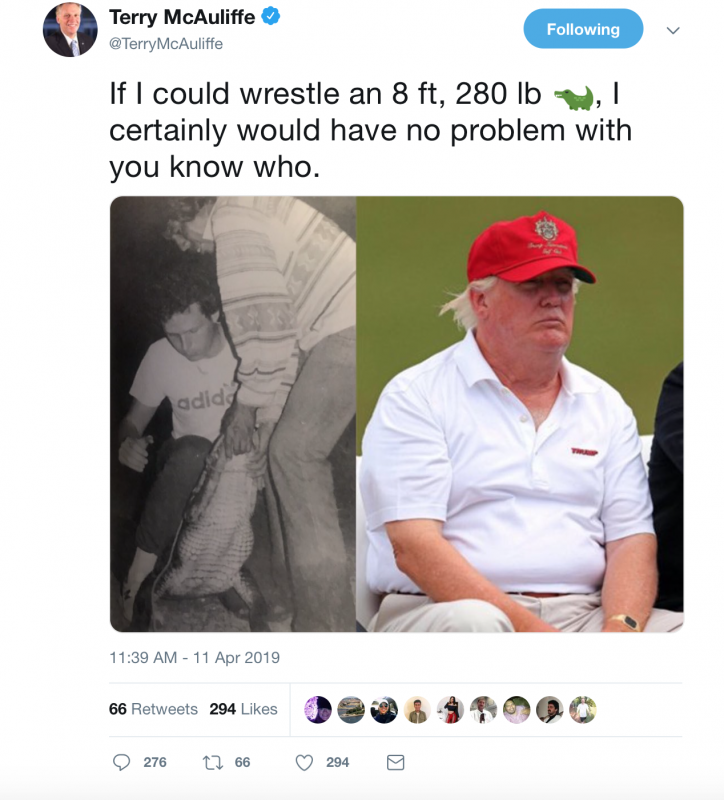 In this latest episode of “Your Guess Is as Good as Mine,” former Virginia Democratic governor and potential 2020 presidential candidate Terry McAuliffe posted a strange and disturbing tweet Thursday suggesting that he wants to wrestle Trump like an alligator. No, I’m not kidding. And please don’t ask me to explain. I’ve got nothing…and neither did the rest of the Internet. The massive Twitter fail was a play on a speech McAuliffe recently gave in Washington, D.C., in which he recycled an old story about him “wrestling” an alligator and claiming that somehow means he can beat Trump. The Washington Post, of course, called it the “perfect meme.” Except that it wasn’t. And Twitter was here to prove it. …but then things got really weird. And let’s just say, Twitter wasn’t impressed. Wow... I just cringed so hard I got my weeks worth of abs workouts in. Dude have you been hacked? Blame it on the drugs. Blame it on Trump Derangement Syndrome. Blame it on the a-a-a-a-a-alcohol. Just don't blame in on social media savviness. There's clearly none of that around here.